The Card Grotto: Cracking Christmas! This card is made using one of my favourite stamps - Elzybells Cracker Surprise. I have stamped him out and coloured with Copic markers adding glitter with my Spica pen to the cracker and his hat, cut out and mounted to SU! Orchid Opulence and added to base with 3D foam pads. Base is made by adding more Orchid Opulance to a white card blank and layering patterned paper on top. Sentiment mounted up also. 3 gems stones added to image to finish. STAMPS: Elzybells Art Stamps. INK: Airondack Pitch Black. CS: Anita's, Craftwork Cards, Stampin' Up! patterned paper by Partners. ACCESSORIES: Papermania Adhesive Gems, Copic Spica At You glitter pen, Copic Markers. So cute!!! Love that little guy and what you did with him! 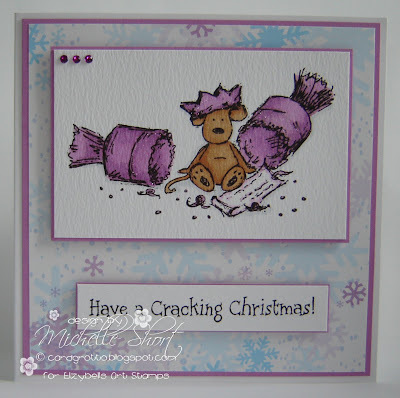 lovely card, and i love the stamp you have used..
Love the colouring Michelle and the DP is perfect!